Due to mechanical difficulties, I wasn’t able to particpate in as many of the festival events as I’d planned. I did manage the first and last days though, and took a few photos while I was out. Click on any picture to see the full sized version. 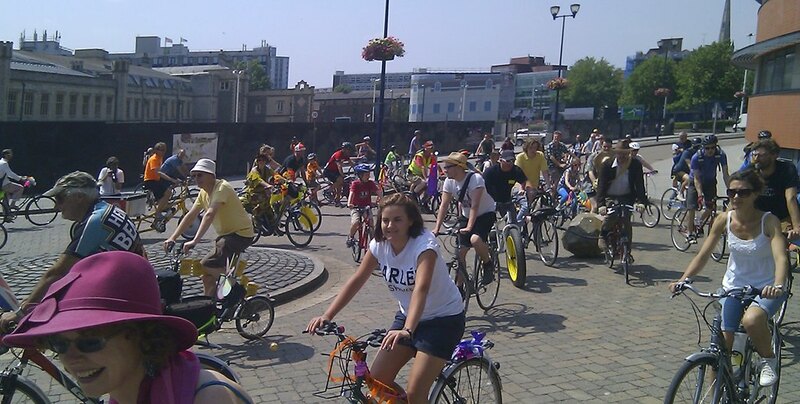 Les Velobici held a fringe event at the Easton roundabout on the evening before the festival proper. For the part I was able to stay for, this mostly consisted of bike skittles. Players ride a ludicrously small kid’s bike into a giant stack of soft barrels, in an attempt to knock as many down as possible. It was surprisingly difficult to get all ten to fall. I couldn’t stay for very long, so I didn’t see what else they got up to, but I’m guessing it was all pretty silly. 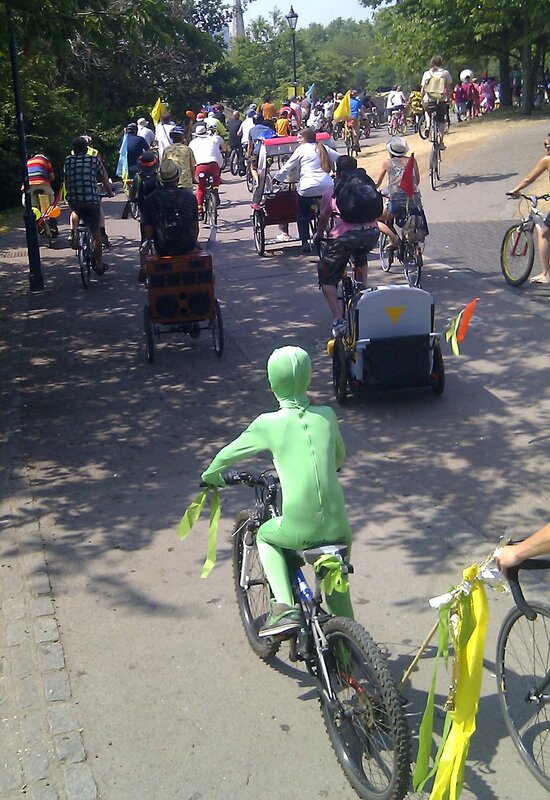 A daft thing to do on a bike, especially on a very hot day like last Saturday. 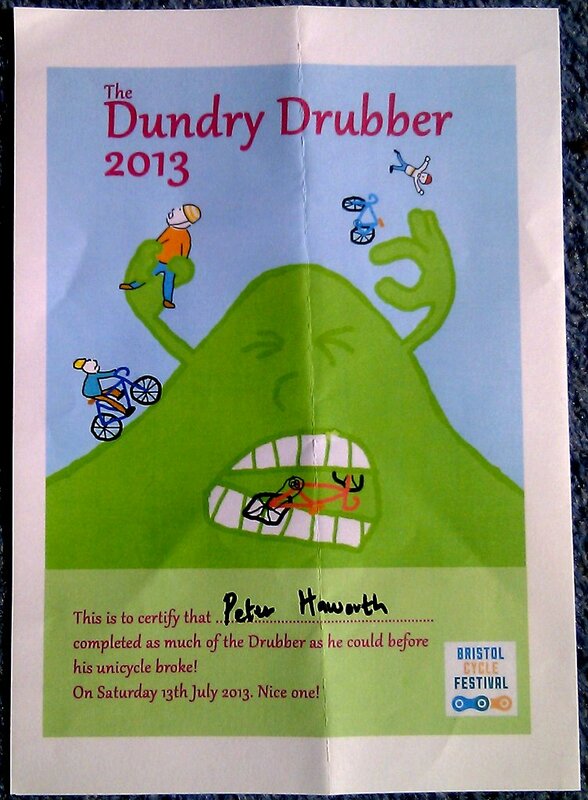 This consists of 4 different ascents of Dundry Hill, all of which are steep, long, or both. Naturally, I attempted it on my unicycle. I managed OK last year, but the recent problems I’d been having with my crank came to a head at the top of the first climb. It was feeling a bit loose, so I tried to tighten the bolt. Unfortunately, although the crank was still fairly loose, it was actually impossible to push it any further onto the spindle. 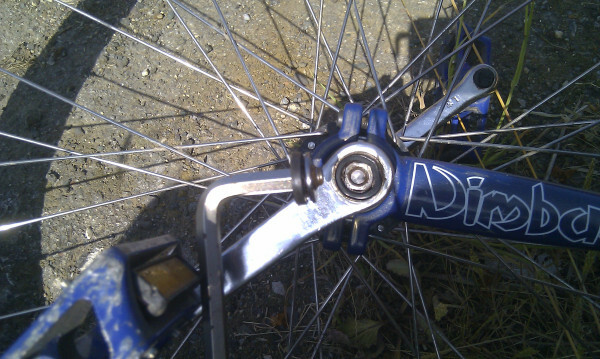 All I succeeded in doing was shearing off the head of the bolt, making any further hill climbing extremely unwise. I did gingerly ride the short flatish road to the pub though, where the crank came off in my hand with no effort when I tried to show how wobbly it was. I finally had enough time to rebuild my wheel on Saturday (replacing only the cranks wouldn’t have been enough), just in time to take part in the UK’s only cycling carnival. The rebuild took the whole day, so I didn’t have time to make a fancy costume, but other people were obviously more committed than I was. 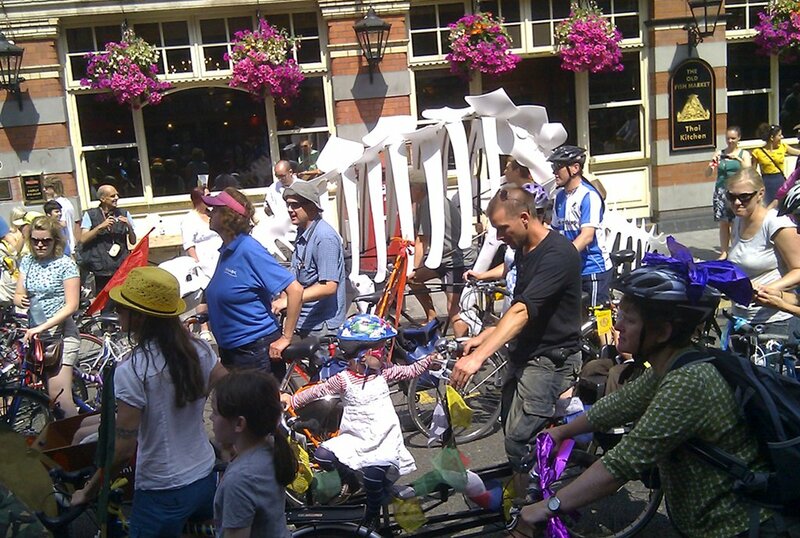 The parade (with dinosoar tandem back for the fourth time) was forced to pause when we hit Baldwin Street, which was closed for Make Sundays Special. It did look pretty special, even in the second month, with bands, food stands and street performance in the brilliant sunshine. 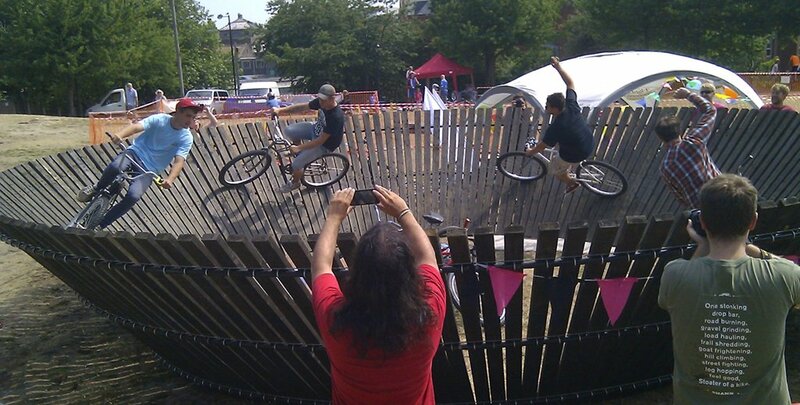 The main focus of the Big Bike Spectacular in Castle Park was The Ministry of Bicycles‘s Bomberdrome, a slightly milder form of a motorbike wall of death. I’d signed up for a ride in the “Bowl Of Harm”, but the surface at the bottom of the bowl was a sandy lumpy mess, which was sadly not worth trying on a unicycle. However, after several abortive attempts, I did manage to ride the wall on two wheels, albeit for only a few circuits before crashing back to Earth. 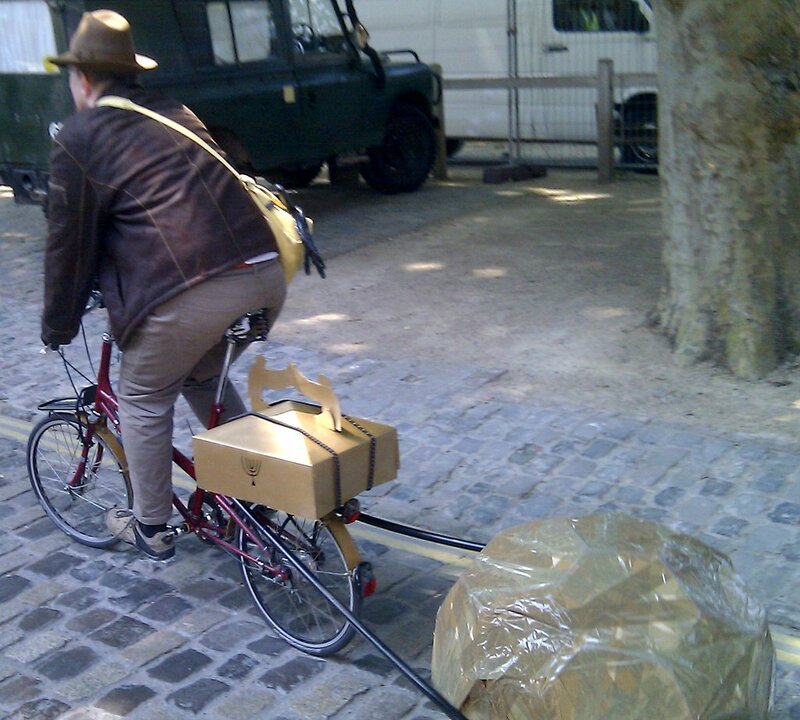 This entry was posted in bristolcyclefest, unicycle. Bookmark the permalink.